Loughrigg Fell is a delightful fell, sitting in a beautiful corner of the lakes between Grasmere and Ambleside, with beautiful views in every direction and with a large undulating top that justifies repeated exploration. The fell is unusually large - the ridge of high ground between the summit and Todd Crag is two thirds of a mile long, and the fell fills an area two miles wide from west to east and one and a half miles from north to south. Loughrigg Fell has steep lower slopes in every direction, with a large undulating upper area (not quite level enough to count as a plateau). 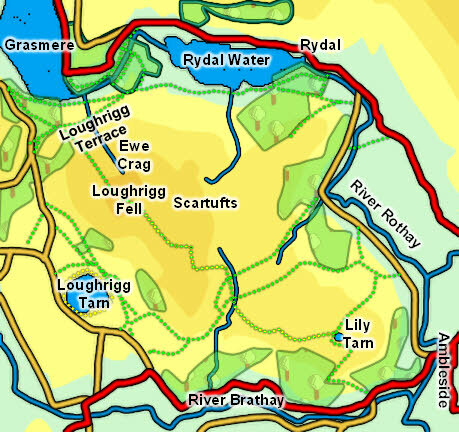 The highest point is at the north-western end of the fell, and a ridge of higher ground runs south-east from there to Ivy Crag, dropping 70 meters. The higher ground then continues east over Todd Crag towards Ambleside, ending with the steep slopes above the main road at Clappersgate. The most direct route of ascent comes up a well built path that starts at the north-western corner of the fell (at the western end of the Loughrigg Terrace). This path climbs in an almost straight line and brings us directly to the summit. There are countless paths around and across Loughrigg Fell, an of which can be used to reach the top. A second good route starts from the rough lane that runs across the south-eastern part of the fell linking Tarn Foot with Mill Brow and Brow Head Farm. About half way across a footpath branches off to the north then turns north-west and runs up the ridge of higher ground to reach the summit from the south-east. Three of our walks either climb or cross Loughrigg. We have an ascent of Loughrigg from Elterwater and an ascent of Loughrigg from the north, while our circuit of Rydal Water heads across the northern slopes of the fell. The highest point of the fell is a rocky outcrop that stands clear of the rest of the large summit plateau, at the top of the path up from Loughrigg Terrace. Loughrigg Fell is mainly bordered by rivers - in the north and east the Rothay and in the south the Brathay. The western boundary is formed by nameless becks the longer of the two flowing south into Elter Water. Loughrigg Fell can claim a short footing on Grasmere and all of the southern shore of Rydal Water. To the south-west Loughrigg Tarn sits between Loughrigg Fell and Little Loughrigg, with a path running all around the tarn. The top of Loughrigg Fell is covered in tiny tarns, most of them unnamed. Lily Tarn, at the far south-eastern corner, is one exception. The fell is also crossed by a large number of nameless becks. On the northern slopes, overlooking Rydal Water, are the remains of quarries that include a massive cave, said to be big enough to take the entire population of Ambleside.